Newtown's Ferris Acres Creamery is one of the 31 Best Ice Cream Shops in America according to Thrillist, a NYC-based media brand covering food, drink, travel and entertainment. After talking a bit about the Creamery's history, the article states, "Today three generations of the family are involved in one capacity or another in the vitally important work of delivering flavors like the s’mores-style campfire and PB-banana Elvis’ Dream to an increasingly ice cream hungry local following." 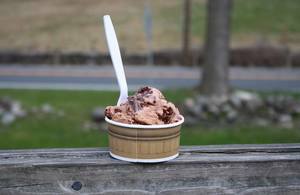 Ferris Acres Creamery, located at 144 Sugar Street in Newtown, boasts homemade, locally sourced, all natural ice cream. Guida's Dairy in New Britain Connecticut supplies the cream for the Creamery's cold, sweet scoops. Ferris Acres Creamery is open seasonally Sunday - Thursday 11:30 am - 9 pm and Friday and Saturday 11:30 am - 10 pm. *Image courtesy Ferris Acres Creamery Facebook Page.